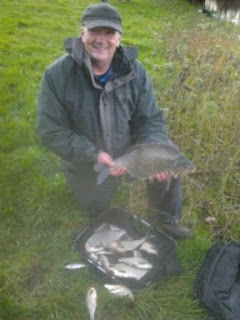 With awful weather again on Saturday we were back out the pond for this one and there were fourteen anglers booked in. After coffee and a sausage sarnie, it was time to head out the pond for the draw as Scott was meeting us out there. There were three golden pegs today, 13, 18 and 19 and there was a good chance somebody would be taking home an extra £100 which would be a nice Xmas bonus. Rob announced the draw and I was just hoping to pull out a peg where I could have a nice days roach fishing but when I opened my hand, peg 1 was staring back at me and although it’s a great peg with a nice feature in the shape of a bush, it’s known more for it’s resident chub than roach. As we unloaded the cars, Steve P, Hurf and Paul Homewood all wanted a side bet and as I took my kit to my peg I passed Rob who was in peg 24 on the other side of the bush. After getting my box level and putting my net in, the first job was to mix up some SSP Baits Black Silt groundbait before setting up my rigs. I set up the usual little Preston Chianti for fishing shallow and a 1 gram Drennan Tipo for fishing on the deck plus a 0.4 gram Drennan Carp for fishing up towards the bush by some reeds to my right. For bait I had the usual casters, maggots and hemp but also opened a tin of Bait-Tech corn and put some pellets on the side tray to bulk out my feed for the chub. Peg 1 – loads of features! On the whistle I cupped in two balls of groundbait at 8.5 metres and then put in two pots of bait by the reeds at 10 metres with the plan to have a look every hour for ten minutes or so. I started on the deep rig with a caster on the hook and was expecting bites quite quickly but the float just sat there! After 15 minutes I was still waiting for my first bite! All the anglers I could see on the far bank were fishing the feeder and I hadn’t seen any of them catch yet either. I tried the shallow rig briefly but the result was the same and it was starting to look like it might be hard going today. I put two red maggots on just to see if I could get an indication and the rig settled and then sailed away, I struck expecting a small roach but elastic poured from the end of the pole as a decent fish tore off. 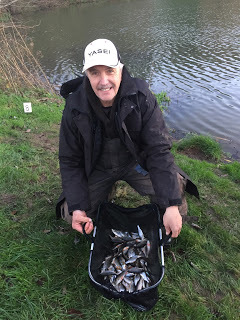 I played it out in open water and when it came to the top I could see it was a chub of 2lb plus and I made sure it was well beaten before taking sections off and managed to net it without too much fuss – bonus! I missed a bite next chuck and then hooked another decent fish which turned out to be a skimmer around the pound mark. So with less than an hour gone, I had 3lb in the net and was doing well, Rob had also netted a good chub so there were a few prepared to have a munch. I started to get some small roach on maggot so switched to caster but it didn’t really improve the stamp of fish, on the hour I had my first look on my bonus fish line with double caster but no indications so I cupped in some more bait and went back over the groundbait line. I had a couple more roach and then the float disappeared again and loads of Drennan Aqua elastic came streaming out as a big fish tried to get under the bush. I plunged the pole tip under the water and gave it as much stick as I dared with the 0.10mm bottom. It stopped after the initial run and I lifted the pole to see where it was, it went off again and I stuck the pole tip back under the water, this felt like a bigger fish and then there was that sickening feeling as the tension was released and the fish came off – bugger! I was sure it had snapped me but on closer inspection, the hook had pulled out, so possibly a big perch but I’ll never know! I carried on catching the odd roach but it certainly wasn’t fast and furious and it looked to be the same for the anglers opposite as they kept swapping between the feeder and the pole. 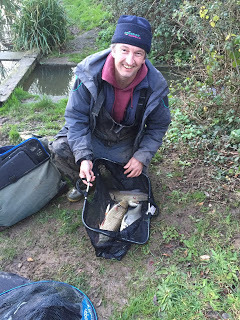 I had another look by the reeds with double caster on the hook but after twenty minutes the only action had been a bumped small fish so after my great start I was now really struggling and I couldn’t help thinking that the big fish I lost could prove costly. I cupped in another potful of feed and felt sure at some point those chub would find it. I went back on the deep rig but bites were now few and far between and although I was doing okay compared to the anglers opposite me, they were in the other section and I had no clue how the anglers to my left were doing. I flirted with the shallow rig again and would get the odd small roach but not the quality you normally get up in the water. The sun was also being a real pain as the reflection was now right where I was fishing so I turned round on my box and fished where I could actually see the float and carried on getting odd roach shallow, including one slightly better one that I netted to be on the safe side. I was going nowhere fast and felt sure I needed a couple more chub so back under the bush I went. I did miss a bite there after ten minutes or so and then disaster struck as I shipped back and my rig was attached to the bush! By standing right over where I’d been fishing by the reeds, I was able to grab the line and pull for a break, I got the float back but the rig was trashed. I cupped in some more feed before getting another rig out and plumbing up again. I went back on the deep rig to let my other line settle down after all the commotion and then noticed Paul Homewood on peg 19 playing a decent fish on the feeder and he slipped the net under a decent skimmer that looked to be 2-3lb and then he followed it up with a slightly smaller one next chuck and there was now nothing between us. 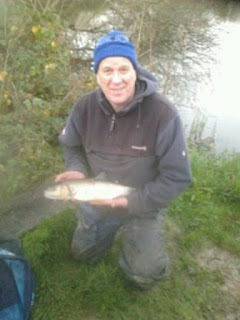 Roger Russell turned up for a walk round and said Scott was struggling over in peg 13 and nobody was really bagging, he asked what I had and I said probably around 5lb (2lb chub, 1lb skimmer and a couple of pounds of roach). He soon got bored watching me and went to see how the others in my section were doing. With about three quarters of an hour left, Paul had added a couple more skimmers and I needed a couple of chub to stand any chance at all today so went back under the bush with my new rig on. I saw Rob strike into a good fish and then lots of swearing told me he’d lost it and I hoped I’d get a chance (or two!) before the end of the match. Fifteen minutes ticked by with no indications and I didn’t think it was going to happen, a further twenty minutes passed and then the float shot under, followed by the pole tip before the Preston Green Hollo came into play and a good chub was on, to be honest it didn’t give me too many problems on the heavier gear and I was soon netting a decent fish of 3lb plus. There were still ten minutes left and with around 8lb in the net, I felt I needed another which would give me double figures and a chance of framing. Just before the end, I had a dip on the float but it didn’t develop and then Rob called the all out. He shouted across that he’d lost five chub today which would probably have been enough to win it. 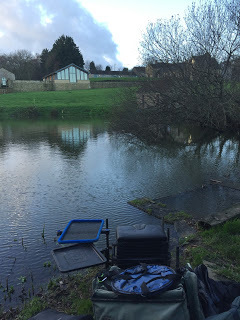 I packed up and went to see how the other anglers in our section had fared, everybody was saying they’d struggled and as Bruce arrived with the scales we would find out soon enough. I was first to weigh and for once I was pretty close with my estimate as the needle settled on 8lb 6oz which I didn’t think would be any good today but Heardy said I’d frame! He’d really struggled in peg 4 where he’d fed two lines for chub and also fished the feeder but only managed a handful of roach for 10oz and when I asked if I could take a photo, I didn’t quite hear what he said but I’m pretty sure the second word was off! 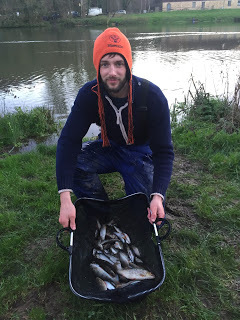 Jake Woodard in peg 5 had a nice net of roach and perch weighing 6lb 10oz and when Justin weighed 2lb 7oz next door, I started to think I might have done better than I thought. 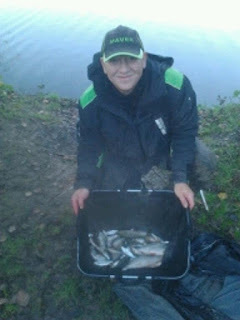 Bruce had over 150 small fish for 7lb 1oz from peg 8 and Stu Alford had 3lb 2oz from peg 10 which just left Scotty in peg 13 and he had some nice roach for 4lb 8oz but reckoned he’d overfed the swim after trying to catch the chub that had shown in the last couple of matches. So I’d won the section at least but I was pretty sure that Paul H had beaten me but there was a chance I might frame. 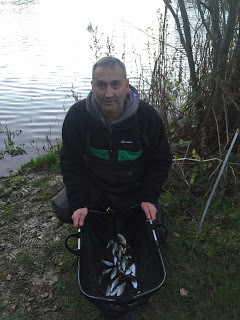 Back at the results and Paul had won comfortably with 13lb 1oz and he reckoned he had 8lb of that in the last hour, as his was also a golden peg he took home a nice Xmas bonus, I finished second and picked up £40 and was relieved that lost fish hadn’t cost me, I lost a nugget to Paul but still finished 2-1 up as Hurf had 2lb 5oz and Steve P had 1lb 15oz. Bruce was third with Jake winning our section and Fieldy won the other section with 5lb 14oz. *Thanks to Steve Hurford for the photos. So a much needed section win in the league for me and after four matches and dropping the worst result, Fieldy leads with five points followed by Martin on seven and me on eight. And finally Against Men and Fish would like to wish anyone who reads this a Merry Xmas and I hope Santa brings you lots of new fishing gear and more importantly that you all catch plenty of fish over the festive period (even the Torquay Tart! ).